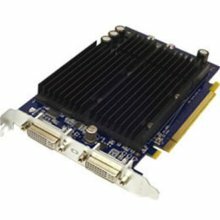 Replacement Nvidia 6600 PCIe graphics card for the Power Mac G5 Late 2005 only. Features 256MB of GDDR SDRAM. One single link DVI, and one dual link DVI port. Supports dual displays to a maximum of one 30 Inch (2560x1600), and one 23 Inch display (1920x1200). This used Mac graphics card has been tested and in good working order. Compatible with Late-2005 Power Mac G5's only.